8/20/2014 Update: Watermark Learning’s PMI-PBA Online Study Exam is now available! Also register for the PMI-PBA Certification Preparation Course today! PMI® has announced its newest credential, the Professional in Business Analysis (PBA). With this initiative, PMI acknowledges the importance of the BA profession and function. 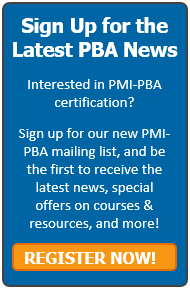 We feel the PBA certification will increase the stature of Business Analysis because of PMI’s new credential, and we’re excited about this new offering. Applications begin May 12, 2014. See more at PMI.org. Many in the industry wonder how this will affect IIBA, and its CBAP® and CCBA® certifications. We see all three credentials co-existing and serving different purposes. As an organization, Watermark Learning has supported both IIBA and PMI and contributed to both the PMBOK® Guide (4th and 5th Editions) and BABOK® Guides (versions 1.6, 2.0, and 3.0). To the best of our knowledge, we’re the only organization that has done so. And, we have long felt that both PMI and IIBA, along with their respective bodies of knowledge, well serve both the business analysis and project management communities. We believe a major distinction between the two perspectives, PMI’s and IIBA’s, is that in the PMI worldview, business analysis supports project and program management. That is, business analysts support the efforts of the program and project manager. The IIBA perspective is that business analysts support the organization. Which does the organization need? Both, of course. Which helps the organization strategically? IIBA. That is not to say that the IIBA has no interest in the part of business analysis that supports the project/program. It’s just that business analysis is so much more. Some of the new PMI-PBA designation goes into needs assessment, which occurs prior to project initiation, as well as evaluating the solution post implementation. Having said that, PMI is mostly concerned with business analysis done during a project. Future Watermark blogs will provide high-level mapping between PMI domains and BABOK Knowledge Areas. For those who mainly work on projects, and for those who perform a hybrid Project Manager-Business Analyst role, the PMI-PBA is a good certification to have. Strategic, enterprise BAs, and those BAs who are professional BAs so to speak, might not gain as much from the PBA certification. We would never discourage them from seeking this new certification, but the IIBA designation will be more meaningful to them. In the end, the BA community can either try to ignore the new PMI initiative, or embrace it and see how the two competing certifications can co-exist. Watermark is doing the latter. We totally support IIBA and its contribution to the BA community. We also totally support PMI and its contribution to the PM community. Ultimately BAs need to understand the PM role and vice versa. They need to collaborate and to communicate, especially in the areas of greatest overlap such as scope management, communications management, stakeholder management, to name a few. Collaboration is the key to project, program, and organizational success. I completely agree with you. The newly introduced PMI-PBA will meet the needs of professionals who wear both hats (of a PM as well as BA) on projects, particularly for smaller projects/companies where enterprise level BAs may not be required or present. Enterprise level business analysis is a very different thing, and needs better skills that can be helped with CBAP kind of certifications. The PMI-PBA will help a project manager to learn business analysis concepts/fundamentals which will help him to better understand requirements, manage scope and manage changes. But he/she may not be able to perform the role of a professional BA with CBAP certification. I’ll recommend PMs to go for PMI-BA if their role demands a limited amount of business analysis and BAs who want to pursue their career in business analysis should go for CBAP. Hi Shirley and NK. Thanks for your comments and perspectives. We agree the PBA will help provide a more focused BA-PM approach on projects and programs. PMI stresses its intent to offer their whole Requirements Management effort (and the PBA) is to improve project/program success. Their research (and our experience) shows that requirements/BA work is key to that success. We think the industry and project professionals will benefit from this work, as it has benefited from the BABOK and CBAP program. Great distinctions NK. Thanks for chiming in with well-crafted thoughts! glad to hear their will be PBA certification, I really see interest in following a role that as you call it “hybrid Project Manager-Business Analyst role”. thanks! Thanks, Anna. Ideally, projects would have separate PM and BA roles. But we all know the reality and many of us have to play both roles.The PMI-PBA is one answer to the challenges of that hybrid role. This is a great opportunity for BA’s that support projects. As an active PMI chapter member, we have several BA’s that are members of PMI. Some of these BA’s join and leave because they don’t see the value of maintaining membership if they are not pursuing a PMI certification. Now BA’s that are actively engaged in projects will have this opporutunity to feel more connected with the PMI community and receive more value in the relationship with PMI. HI Michelle, thanks for weighing in. We think there will be many BAs who have been or still are part of PMI who will welcome this new credential and interest from the PMI community in business analysis. It may also help with better collaboration between PMs and BAs – hope so! This is excited news. I’ve performed the dual roles and independent roles. I have both my PMP and CBAP. I’m wonder if there is value in me getting the new cert if I already have both. The concept is great. I hope Watermark will come out with a training program for it. I uses their book to study for the CBAP. It was awesome. So much easier and user friendly than the PMP study options from other companies. Hi Sheryl, like you Elizabeth and I both have the PMP and CBAP,and so does Vicki James, our BA Training Director. We all find it valuable to have both. All three of us will get the PMI-PBA, partly because we are trainers. But also we believe in what PMI is doing (like we also support IIBA). I’m glad you found our CBAP Guide useful and friendly! We plan to have an online study exam, a study guide, and a course for PMI-PBA prep this year. Watch our new Certification Brief for announcements. Thank you very much for differentating between the PMI-PBA & CBAP certifications. I recently sat for the CBAP exam and did not pass. Going into the exam, I studied about 80% of the material, even though, I was told I needed to know 90%. They weren’t kidding! I’m planning to sit for the CBAP exam again soon. I wanted to research the difference between the PMI-PBA, CBAP (based BABOK version 2) vs. CBAP (based BABOK version 3). After reading through the articles on this website, I’ve been able to make my decision to stick with obtaining the CBAP (based on BABOK version 2). I’ve been an independent consultant for 20+ years working as a Project Manager/Business Analyst on large scale software development projects for the big Pharmaceutical companies (i.e. Merck, Pfizer). At this point, I’d like to focus my career on enterprise wide BA work, as opposed to, the project BA work. After reading the article above, it was an easy decision to stick with obtaining my CBAP certification. Thank you again for the great article. I am currently working as PM but I have been a BA for a long time. BA and PM are interdependent roles but the area of focuses are definitely different. With the exception of small projects/topics, no one can do both roles at the same time. I have tried doing it once for a banking project and it was a disaster. Please remember that PMI is a project management institute and the PMI-PBA is created to address the knowledge required by a BA who is working under the supervision of a PM in a project environment. On the contrary, IIBA actively promotes BA as a role that is equal or independent to that of a PM. IIBA also indicates that the BA profession exists at both the enterprise and project levels. If I am interested in pursing BA as a full time career, I will definitely support IIBA and the CBAP certificate because IIBA actively promotes my interests as a professional BA and they have been doing it consistently since 2006. I cannot trust PMI to do the same when their main interest is obviously still in project management or in their PMP credential. If I am already a project manager or PMP, I do not see why I will want to take up the PBA other than to add another title after my name. As a project manager, why will I want to distract myself by doing BA work when I am already having a hard time controlling my project? Thanks so much for your comment and for expressing your views. While we don’t agree with everything you say, we are glad that you wrote and shared your opinion! We very much salute your desire to pursue the BA as a full-time career and your support of IIBA and the CPAB! This sounds like a great career move. Personally, even though I was a PM for many years, I love BA work! I do want to address your statement that “the PMI-PBA was created to address the knowledge required by a BA who is working under the supervision of a PM in a project environment.” There is an entire section of the PBA that addresses Needs Assessment, for example, and this is pre-project work. This is just one example–there are more. In case you have not already done so, it might be helpful for you to read the PMI 2014 Pulse of the Profession for a complete definition of business analysis. As I suspect you know, we work extremely closely with both PMI and IIBA. We think each contributes significantly to the communities they serve. As noted in the blog, we see the benefit of both designations (PBA and CBAP). Again thanks for writing and enjoy your career as a BA! There is a section on Needs but I believe PBA is concentrating more on projects whereas CBAP is focusing on a much wider area. There has to be a difference between both certifications.It will be really stupid if PMI ends up with a BA certification that matches too closely with CBAP. There are already a lot of misconceptions about BA as a lesser role or subordinate role to PM. I hope PMI and the PBA will not further enforce this misconception. I hope not, too. I’m optimistic at this point that PMI is joining IIBA in viewing the BA role as a peer-to-peer with the PM. I see PMI moving in that direction. I also see a slight inclination on PMI’s part to view the business analysis work that needs to get done as needing to be done regardless of the title. I think it’s in flux, but suspect we’ll see more use of the word “practitioner” from PMI, meaning that it’s work that’s more important than who does it. We’ll see. This will probably end up as another PRINCE2 verus PMP scenario. Previously there are a lot of job advertisements which says “PMP required”. Nowadays, I also see a lot of job advertisements which says “PMP or PRINCE2 required”. In the future, we may see BA job advertisements which says “CBAP or PBA required”. As long as PMI remains as a project management institute (with their main focus on PMP related credential), it cannot control the entire market for BA certifications. IIBA’s devotion to BA certifications is both a disadvantage as well as an advantage. I believe that the launch of the PBA will continue to force people to look at IIBA and PMI as two very different organizations with very different focus (one with is devoted fully to BA providing two levels of certification: CBAP/CCBA and the other is still focusing on PM/Projects). It may lead people to see the CBAP/CCBA as the BA equivalents of the PMP/CAPM and the PBA as a supplementary certification to PMP. It will be interesting to see what happens in a year or two. Thanks for writing! One obvious differences that I notice between PBA and the CBAP is the experiences requirement. PBA requires only 4500 hours for graduates and CBAP requires a straight 7500 hours. Having a degree is probably the most minimum requirement for most business analyst. We are looking at a difference of 2-3 years of working experiences. I believe this is also the reason why the take up rate for CBAP is slower. Compared to project managers, business analyst is still a relatively new role and its difficult for most people to accumulate 7500 hours unless you are consistently working in a BA role. Looking at this point, the PBA may be easier for some people especially those who are in hyrid roles (some PM and some BA). The CBAP will be a stronger certification for those full time BAs who are very senior and well experienced. Over the past few years, PMI has been trying to expand their business by coming out with all sorts of certifications ranging from agile to portfolio management. But the only credentials that people really recognized PMI for are only their PMP and CAPM certifications. PBA is just another one of their half hearted attempt to make more money from PMI supporters or to expand their existing PMP membership base. Not sure why people are excited about this certification, if I already have a CBAP I will rather do the higher level BCS BA diploma then to waste money on another equal or lesser BA certification from PMI. The only thing i will try to get from PMI is their PMP certifications anything more is just a waste of money and time. We’re sorry you feel this way, but happy that you wrote to us. Certain industry standard organizations, of course, have more credibility in certain parts of the world.The BCS certainly has its proponents, as does PMI. I think it’s always good to be purposeful about one’s career and each of us needs to choose certifications most meaningful to and best able serve us. Good luck with your career and thanks again for writing! The PMI-PBA may become a middle option between CCBA and CBAP. There will be people who find the CBAP too tough and the CCBA too basic and they may choose to take up the PMI-PBA first while they save up those 7500 hours. I did my PRINCE2 first while I save up experience s for my PMP application. If we are only looking at the experience requirement (its probably very hard to find any business analyst or project manager who does not have a degree), CBAP is definitely on a higher ground than the PMI-PBA. As a BA myself, I seriously doubt that the PMI-PBA will make much of a difference to the current market situation. Unlike project managers where the knowledge of standard project methodology is an important (sometimes overly emphasized) requirement, BA are still mainly hired for their domain, solution and industry knowledge. BA certifications are just good to have. The real BA skills are usually being developed on the job. If I am a new candidate for PMI, I will still aim for the PMP/CAPM certifications first before I try anything else on their product listings. PMI is a project management institute and project management certifications are what they are known for. If I am already a PMP, I will not be rushing in to take up the PBA certification. There are some CBAP and PMP dual holders but these people only represents a minority. Majority of the people I know just stop after they obtained their PMP and this may explains why the take up rate for PMI’s other project certifications are not as good as previously anticipated. Just a seperate question, I was comparing the watermark PMP online examination against the one offered by trancender IT. The latter offers 300 more questions. Should I be concerned? Thanks for your comments and opinions Kelvin. I guess we’ll let the industry sort this out–there’s so much speculation about what will or will not happen. Recently I have had several people who play the dual role of BA/PM say they were planning to take the PMI-PBA exam. I do know that PMI had an overwhelming response to their PBA pilot, so I know there’s a great deal of interest out there. OK–online PMP exams. I would ask how long each organization has been in business (Watermark has been training business analysts since 1992 and project managers since 1996), how long they’ve been teaching PMP Prep (we’ve been training PMP certification about 15 years), how close the questions are to the exam (our feedback is that our questions are very close and really help prepare PMs for the exam). Check us out. 1. Compared to the PMI-PBA, the BABOK knowledge areas and tasks are well defined and intuitive. I cannot say that the BABOK is perfect but as an old school BA, I can immediately associate my past experiences with the BABOK areas/tasks like Enterprise Analysis (naturally with the business case as the key deliverable), Requirement Elicitation (which clearly deserves to be a separate knowledge area on its own)…. 2. I have a feeling that PMI is trying very hard to structure the PBA domains based on the existing PMP framework. It has that same look and feel. I will wait for PMI to come out with a second or third version before I will consider taking this certification. While IIBA is a less popular organization than PMI, they have been working on their BABOK for the past 10 years and I believe the people in PMI will find it difficult to break through on what IIBA has already achieved in terms of BA knowledge and content. Thanks for writing, Mark. I’d like to address your points. 1. Just checking to see how you like BABOK 3.0. Having been a lead author on the 2.0, I’m glad you found it helpful. 2. If you read the PBA and PM role delineation studies, which the exams are based on, you’ll see some differences between the domains in the PMBOK and the PBA. The PBA includes Needs Assessment, which is pre-project work, and Evaluation which is post-project work, neither of which are in the PMBOK. 3. While it sounds cool, there is no such thing as a PBABOK. We are just finishing writing a Business Analysis Practice Guide which should be helpful to those wanting to learn more about about business analysis and those studying for the PMI-PBA exam. It will be interesting in October to see how many PBAs will be announced. I sincerely hope that IIBA finds a way to encourage more BAs to become CBAPs or CCBAs. Just one last comment for today. As I mentioned previously, its difficult for PMI to come out with any new BA knowledge. Rather than coming up with a another certification (which really achieves nothing new in terms of actual content), why not just collaborate with IIBA to provide a joint BA/PM cerification? This is a good article. Rather than calling it two BA certification, i will say that the CBAP and PBA is on a different level. Even if i take the PBA, I will still take the CBAP certification if I am pursing a long term career as a senior BA. The criteria For CBAP is definitely higher, 7500 hours and must be aligned to their BABOK (very tricky, you must know the BABOK when you apply). CBAP is a better option to show my profile as an independent and well experienced business analyst. I will see CBAP is an upgrade to PBA. I read on the PMI site that they will not document a full BOK for the PBA but rather they provide a practice guide (as highlighted by Eliz) which links back to the PMBOK. This is another advantage for IIBA because they have a very mature BOK just for BA only. Also a lot of people already starting to see the CBAP as the BA equivalent to the PM PMP, thats why i see a lot of people holding dual titles (CBAP, PMP) to show their capabilities as either an independent BA or PM. I believe this trend will still continue. What IIBA need to do is to lower the criteria for CAPM so that it is closer to CAPM. 3750 hours is still too much for a junior BA. sorry for posting twice. but i believed rather than promoting a fight between IIBA and PMI, there are rooms for both to work together while IIBA can still maintain their authority as a higher and independent organization for BAs. Since the PBA is also designed by many people who hold both PMP and CBAP qualifications, i hope these leaders can do their part to ensure the co existence of both IIBA and PMI. IIBA need to work harder to show why the CBAP is still the authoritative certification for BA and why it can co exist with PBA. Contrary to urban legend, PMI made a broad offer to collaborate with IIBA on Business Analysis standards and certifications. Unfortunately we understand IIBA declined the offer and we’d be speculating about the reasons why the collaboration didn’t come to fruition. We have heard similar things, although one of our instructors found it difficult. I would advise people thinking of taking the exam that they are planning on adding a larger variety of questions which will be more representative of all the domains and all the techniques in each domain. Thank you very much Elizabeth and Richard and thank you all for the valuable comments. I am hybrid PMP-CBAP and I am indeed working as a PM and a BA day by day. Most often I have the role of the PM and I am collaborating with BAs in my projects. I am trying not to conduct or the to lead BAs, I am trying to collaborate. Very similar to what a Scrum Muster does within the team, collaborate with the Scrum Team and the Product Owner, removing road blocks. Saying this, I think it is mandatory for PMs nowadays, to look beyond the PMBOK and the old-school project management, i.e. learn and understand what Business Analysis means for both, plan-driven and change-driven projects. A PMP will for sure be closer to the PBA certificate, simply for the terminology point of view. The BABOK contains more e.g. in Enterprise Analysis, but does the typical PM really needs this in regular projects? Maybe PBA is sufficient. Again thanks and greetings form Germany! Thanks for your thoughts, Rainer! Well said. We also think the PBA certification will appeal to PMPs and PMs in general who either perform business analysis themselves or like you those who collaborate with BAs. Have you taken the exam yet? Let us know when you get your credential. Luckily I have passed, got the news yesterday. I am a PMI-PBA now, isn’t this a long something behind your name? Many congratulations Rainer!! Luck perhaps–more likely great experience and definitely well-deserved! I am a sap consultant in Materials management and I do have a degree in marketing management. I want to pursue a BA role in ICT sector in conjunction with change management,service delivery management. Thank you for your question. Looks like you’re on the right track in developing your career! I am passing on your question to one of our Training Consultants and they will follow-up with you very soon.